Art and craft ideas using upcycled materials can produce very impressive results, such as this beautiful pendant made partly from cereal box cardboard. As cool crafts go, this unusual artsy looking pendant is a great example of just how cool you can get by upcycling what would otherwise become junk to be thrown away. 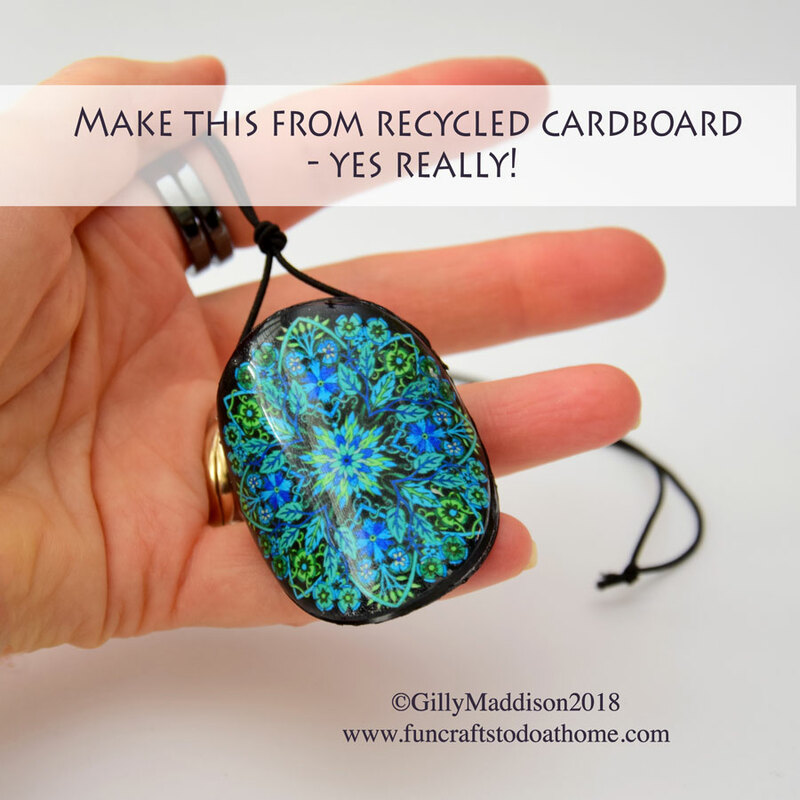 And once you see how to treat cereal box cardboard to make it into a solid pendant base, you realise how valuable scrap cardboard is when coming up with new art and craft ideas. Click here to go to the video I made showing exactly how to make this upcycled pendant. Click here to see the video showing how to make this pendant from upcycled cereal box cardboard. If you are new to crafting and are looking for good art and craft ideas to begin with, this is a great project because the results are quick and stunning. By the time you have finished working your magic on an empty cereal box, you will see just what a strong and solid object you can create with a flimsy piece of junk and you will find art and craft ideas flowing from your crafty mind. You will never throw away another cereal box again and you will start looking at other junk differently as you wonder how you can turn more trash to flash. The pictures above show how my mind works since I focused on getting art and craft ideas from the smallest scraps of trash (or rubbish if you are English). I saw this bland and insignificant piece of scrap wallpaper in a rubbish bin at The Range a while back while I was wandering around looking at craft supplies. My immediate thought was the challenge of how I could use it to make something pretty and wearable and so I asked if I could have it. I think it stunned the young guy who was cleaning scraps up off the floor in the wallpaper area when I asked if I could have it. I couldn\'t even steal rubbish from a bin! If you want to see the post I wrote on what I did with that scrap of paper, click here. Children love art and craft ideas that use junk too and this cardboard pendant project is a lovely one to do together to perhaps make a beautiful upcycled gift for someone. For any teachers reading this in these times of limited resources in many schools in the UK, you\'ve probably already figured out the value of scrap cardboard boxes. These kinds of projects are great for getting children thinking about recycling while being creative with the earth\'s resources. It does fire the imagination when you can turn something so mundane into a piece of pretty jewelry that no-one would even guess is made from cardboard junk. On the right you see the sanitised version of my trash stash taken last year - but on the right is the honest version of my trash stash in my workshop. Yes - I am a garbologist! Of course you will need other items to make the pendant in my video. You will need some good PVA glue because it\'s the PVA that ultimately gives the cardboard it\'s strength and makes it completely ridgid, like a light wood. You will also need a design for the front of your pendant and although I used a mandala design from a coloring book (click here to see the post and video on using your coloring book work in crafts), you could easily find a stunning design to punch out of a magazine; unwanted magazines are another great source of inspiration for art and craft ideas. I update my Amazon storefront with new links each time I make a new video, to help people find the resources they need to try out the projects. Watch the video through to the end to see the unexpected blip I had a couple of days after I finished the pendant. See how I fixed it and then tell me, in the comments section under the video on YouTube, what you think I could have done to avoid the blip in the first place - I love hearing other people\'s ideas because there is always more than one way to climb a mountain! Thanks for reading and let me know in YouTube comments if this helped you with your art and craft ideas - see you next time on Rainbow Lane - the YouTube channel to get you creating. Previous Previous post: Coloring Book Magic – How To Show Off Your Beautiful Coloring! Next Next post: Metal Recycling – Make A Cool Candle Holder From Tuna and Pop Cans!